This is our pet, Bunny. She is nine months old. Bunny is special because she was my Valentine's gift to my wife. 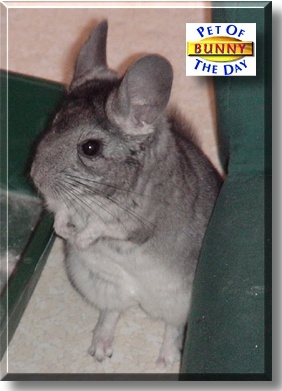 She is a loving little Chin, who got her name by the way she likes to jump around all the time. And, just recently, she warned us of a burglar tampering with our cars Bunny sent off her 'alarm call,' that really loud, throaty whimpering that can be heard at the other end of the house, and when I went to check, saw someone in our driveway, bent over a car. When I flipped on the kitchen light he ran away... Bunny is our hero chinchilla!